I don’t know about you but I love sweet potatoes all year long. Of course as soon as fall arrives you start seeing more sweet potato recipes floating around. At our house we enjoy them simply dusted with a little bit of ground cinnamon as a dessert or filled with a smoky lentil chili for a savory meal. I have been known to carry one with me in my purse as a snack! 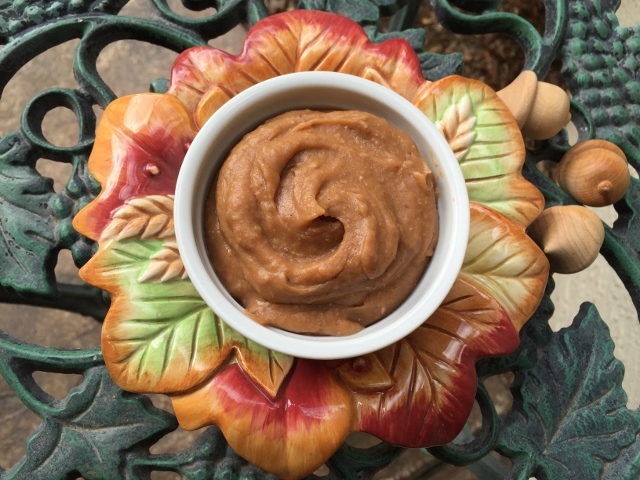 Did you know that a sweet potato could be transformed into a whole food plant based pudding that is salt,oil and sugar free? Me neither until a fellow Chef AJ Ultimate Weight Loss member named Nalida shared her amazing Sweet Potato Pie Pudding dessert. Necessity is the mother of invention they say. That was true for Nalida. She was having some dental work done and needed some soft foods to get her through the healing process. With that in mind she tossed a few ingredients in the Vitamix and both her and her family were delighted with the results. You will be too! Half the recipe still filled 4 small ramekins – I would say these are about 1/2 cup servings. Just the right amount to make you feel like you had a lovely treat but not too much to make you feel like you over did it! I grated a little fresh nutmeg over the top before serving which added a nice little bit of that fall holiday flavor that we want. I think you could use pumpkin pie spice in place of the nutmeg too if you wish. If you don’t like sweet desserts skip the dates – that is what I did. Just make sure to use a very ripe banana as it will add plenty of natural sweetness. If you have some maple balsamic vinegar a splash of that on top would be killer! 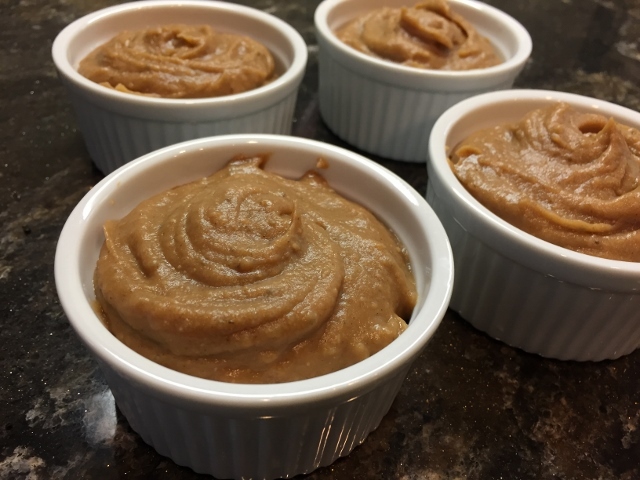 Nalida wrote: It LOOKS like butterscotch pudding but it has all plant-based ingredients and no added sugar (just sweetened with fruits). And can you believe one ingredient is white beans? My family loves my Sweet Potato Pie Pudding (I named it that because it tastes like it). Mmmmmm! 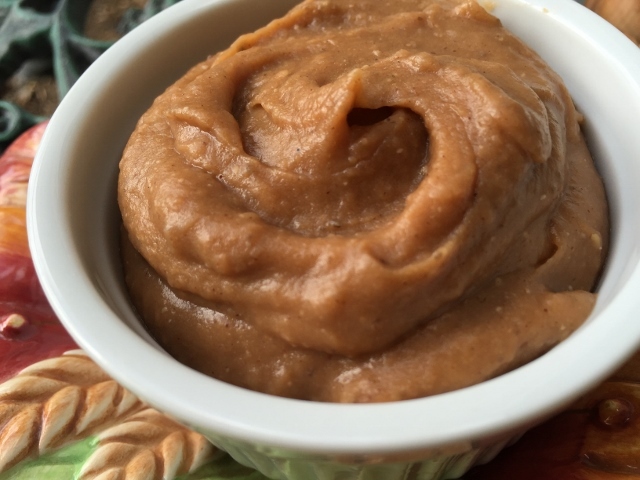 Cook the Garnett yams in a pressure cooker and purée everything in a high powered blender like a Vitamix or Blendtec. If you don’t have a high powered blender try making it in your food processor. I had to add a little more almond milk to make mine thin enough to blend in the Blendtec blender. *Tami’s Notes: I made it without the dates and used a very ripe banana for a half batch and it was perfectly sweet enough for us. Eat & enjoy! A big thank you to Nalida for coming up with this lovely recipe and allowing me to share it. Recipe created by Nalida Lacet Besson and shared with her permission. I learned from Chef AJ how to sub cooked white beans for cashews in recipes. I have been having success using this in soups to make them thicker as well as salad dressings. It’s a nice way to reduce the calories and fat in recipes. Its helped me to lose weight too – although I love nuts they are little calorie bombs! Tomorrow I am flying to Nebraska to visit family and friends. I won’t be posting here while I am gone but I will be posting on the Nutmeg Notebook facebook page so follow along there and see how I navigate my plant based diet while traveling. It’s always an adventure! Feel Free to add your thoughts. Have you tried using white beans in place of nuts in any recipes? Do you have any other healthy food swaps to share? That ;looks amazing Tami!!! Safe travels & have fun!!! I’m so glad you both enjoyed this recipe! Thank you for taking the time to let me know. It’s always wonderful to get feedback. Happy Cooking! It’s a big hit this time of year! Enjoy! I have some maple balsamic coming from Bema and Pas this week. Gonna make this and try that out! I love your blog! You will love the Bema & Pa’s vinegars! Thank you for your kind words – it’s nice to know people find value in my posts. This will definitely be on my Thanksgiving menu. Thank you!